Saint Anselm College thrives because of its long-standing traditions, both large and small. Whether it be the holy tradition of the Benedictine monks or the yearly gingerbread house competition, Anselmians find comfort in these traditions. Yet, there are occasions when a much-needed change benefits the community. One such change is the impending switch from Sakai to a new learning management system, called Canvas. All faculty must complete the transition to Canvas by Dec. 31, 2018, when the school’s Sakai registration will expire. Canvas was developed in 2008, making it a relatively new learning management system. The program uses open, cloud-based technologies to store content, tools, and services. Despite being a newer platform, Canvas is gaining popularity among national colleges and universities. According to Inside Higher Ed, Canvas has recently beaten out Blackboard, a competing learning management system, as the leading platform at colleges and universities, according to new data from MindWires Consulting. Given the increased popularity of Canvas, it was only a matter of time before Saint A’s made the switch. Since the college adopted Sakai eight years ago, other learning management systems have improved, and new products have been made available. Round noted that faculty and students at the college were complaining that Sakai’s interface could be challenging. In response to these remarks, and with support from the Dean, IT created a faculty working group to investigate new learning management systems. “After further evaluation, Canvas emerged as the front runner,” said Round. 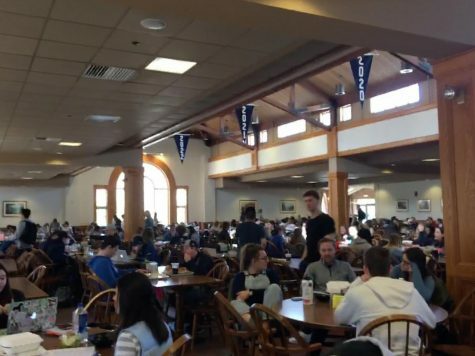 While Canvas has been deemed the most suitable platform for Saint Anselm, many students still face the switch from Sakai with uncertainty. “I’m expected to know what to do on this website and submit assignments already, yet I don’t know how to navigate it,” said a Saint Anselm student during one of the first days of the fall semester. “This will definitely take some getting used to,” said Caroline Morison, a Junior accounting major of Burlington, MA. Despite initial uncertainties during the transition process, Round is confident that the switch to Canvas will be in the best interest of the college. In fact, Canvas received positive feedback from students and faculty at the college when it was pilot tested in 2017 in multiple courses. Students and faculty can have confidence that IT is equipped to assist the college during the transition. The department will provide additional workshops to train community members on Canvas, and will also make resources available online. Round also added that the 24/7 technical assistance that Canvas offers has proven to be effective. Faculty have been kept up to date about the switch to Canvas throughout the decision-making process through the Dean’s All Faculty meetings, the Curriculum Committee, and a Canvas Open Forum. Now, faculty have had six months to explore the new system, learn its functions, and transition their courses, in preparation for the complete switch during the upcoming spring semester. IT has been available to faculty members throughout this process. Professors are not required to transition to Canvas until the beginning of the spring semester, but some have already made the change, while others remain on Sakai. Currently, 80 percent of faculty members at Saint A’s use a learning management system for their classes, whether it be Sakai or Canvas. Now, 75 percent of those faculty are either completely on Canvas or are in the act of moving their class information. The limbo between the two platforms has caused some inconvenience for students: “I wish all my classes could be found on the same site. The transition period will be confusing, and it would be more convenient to have everything in one place,” said one student. “One of my professors is still using Sakai, while the others are on Canvas. It would be better if there was a consensus on one site to use,” added Morison. While the transitional period may spark some confusion, students may find comfort in the fact that it is only temporary. Overall, students have expressed optimism about Canvas. “I like Canvas better than Sakai because I am able to access my account from an app where I can check my to-do list, notifications, and course content,” said Jillian Petrillo, a junior Elementary Education major from Mansfield, MA. “I think Canvas iPhone app will be helpful. I can check in with my classes more frequently,” continued Morison.